Finally, the plans for three-strand, personalized grandmother bracelets! Enjoy! Lay out beads on a bead board as per the pattern. You will need to shift the beads around to make them fit properly, so be aware that your grandmother bracelet pattern or layout is not set in stone. The pattern for the example has a great layout for a three-letter name, a five-letter name, and a seven-letter name. Other names may have 4, 6, 8, or more letters and you will need to use your creativity to design your strands so they all end up being the same length. Cut your lengths of string cable. 12” should be plenty. You want more than enough cable so that you don’t have problems with finishing the ends. Since your finished grandmother bracelet will be around 7” or so, your 5” buffer should be plenty. If you are making a longer grandmother bracelet, then certainly cut longer. 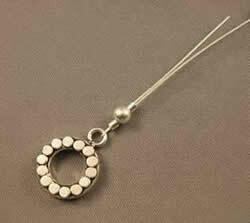 Use a beadstopper or a piece of masking tape on the end of your first cable strand and tart stringing. When finished, stop the end with more tape. After you’ve strung all your beads, drape them across your arm and see how well they drape and if the multiple strands look nice together. At this point your beads should be approximately 5”-5½” inches long, strung together. Be careful not to overstring - you need to leave room for the clasp, the crimp, and the crimp covers. 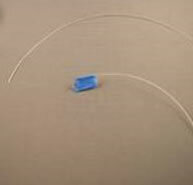 If you have a strand separator, attach one end of the strand separator to one side of the clasp with two jump rings interlaced (two jump rings are much less likely to open than a single jump ring). Do the same for the other half of the clasp and other separator. Adjust by adding beads or removing beads as necessary to get the proper size. Take the end bead off, then string one crimp, string the bead you removed, string a second crimp, half a wire thimble, the clasp ring (or strand separator for a multi strand grandmother bracelet with separator and clasp), the other half of the thimble, and then go back through the two crimps. Pull gently, using your pliers and your fingers to help guide the cable. Making sure that the cable isn’t twisted inside the crimp tube, and then crimp the tube. Cover with a crimp cover. Do the same with the second crimp tube. Be sure to leave enough room so that you can add the crimp cover. The covers are slightly bigger than the crimps so you need to leave a slight gap between the crimps. Cover the crimps with your crimp covers by using your crimping pliers (the semi circle part) to gently close the crimp covers. They will look like silver beads. Do the same for the other strands, but just one side only. 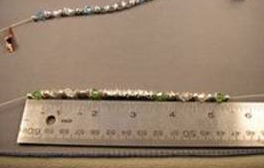 We need to be able to measure and adjust before doing the final side of the bracelet. You should now have one end of your bracelet finished. the end of these instructions. Note: These pictures don’t show the wire thimble. I took these pictures before my bracelet broke. Now I always use wire thimbles to reduce the stress on the folded part of the cable. Remember not to pull too tight. (In this picture I have a bead in between the crimps. However, I suggest for beginners, just string both crimps with no bead in the centre). Do the same as in step 8, except don’t crimp the crimps yet. Using the bracelet sizer, do one last check on the sizing with the clasp closed. Getting the perfect fit is the trickiest part of the process (at least for me), so I always double and triple check. If you are satisfied, go ahead and crimp those crimps, clip the ends of the cable with your flush cutters and add your crimp covers. Add your charms and dangles. These are necessary because they serve as counterweights so that the bracelet front doesn’t go to the underside of the wrist all the time. For the charms that are attached with jump rings, just add them where you’d like them. You can find the instructions for opening and closing jump rings here. For the others, take a headpin, string a crystal, then string a bali bead, and attach them to wherever you’d like on the clasp using a wrapped loop. The wrapped loop instructions that I use for my grandmother bracelets are here. As promised, crimping instructions that will help you make your grandmother bracelets. Can't find the right charm for your grandmother bracelets? We made a list of our favorite bracelet charms here.